Get familiarized with the payment processor Stripe. In terms of selling publications, we are collaborating with Stripe, a leading platform for online payments. With this tool, you will be able to charge readers for access to your publications and collect Credit and Debit card payments. Note: Please keep in mind that at the moment, Flipsnack can only provide this selling feature in countries supported by Stripe. Here you can find a list of the supported countries. How to use Stripe on Flipsnack? In order to be able to sell your publications through our platform, you will need to create a new account on Stripe (for free) or add an existing Stripe account to your Flipsnack account. If you are new to Stripe, you will be able to add the email you would like to use together with the requested details, and we will create a new Stripe account for you. If you already have a Stripe account, we kindly advise you to connect your current Stripe account to Flipsnack. Note: Please keep in mind that before you can start accepting live payments, you will need to confirm your Stripe account by accessing the verification email received and by clicking on the “Confirm email address” message inside the email. How to collect my Payouts? 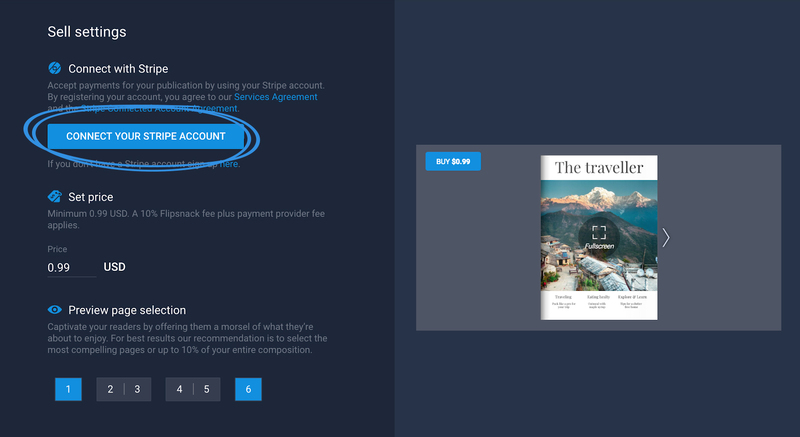 When a publication is sold, the payment is posted directly to the Stripe account of the user. Users can transfer the deposits (payouts) to their bank account manually or automatically. Once users start processing with Stripe, the first payout is made 2-10 days after the first successful payment is received. Here you can find out more about Stripe payouts. What are the costs of using Stripe? Stripe fees are variable, depending on the geographic location of the user and the payment methods chosen. Here you can find out more about Stripe pricing and fees. Please make sure you are reading the correct information about your country by updating it in the footer of the Stripe website. Stripe costs are usually set as a flat fee of 20-30 cents + a percentage from the sale, usually under 3% per publication sold.